It is a “first world problem” but a problem nonetheless. 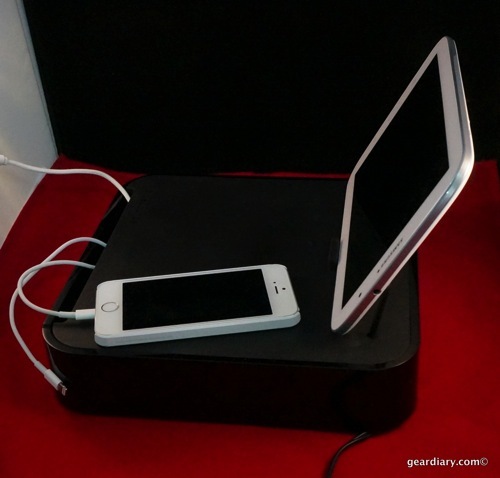 As mobile gear multiplies, the need to charge them in a convenient manner becomes increasingly important. 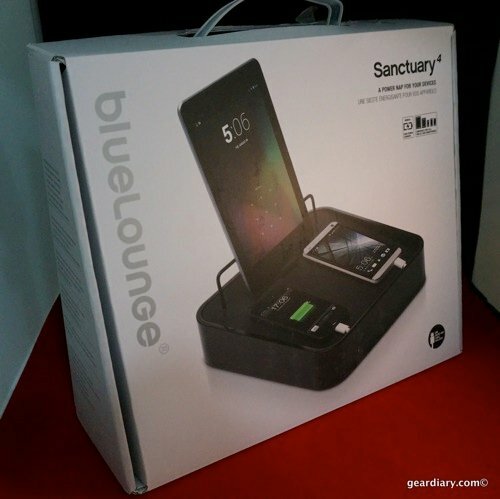 Bluelounge’s Sanctuary4 promises to keep up to four devices charge while conveniently keeping things organized and accessible. At $99.95 it might appear a bit pricey, but the convenience and functionality are sure to impress. The Sanctuary4 comes in either Black or White and includes a short USB to microUSB cable to help get you started. 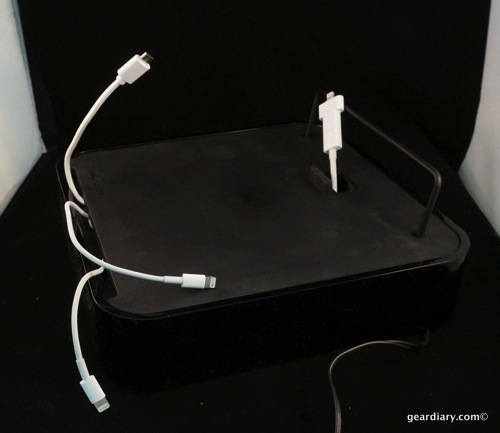 Also included in the box is the AC wall adapter that brings power to up to four different devices at a time. 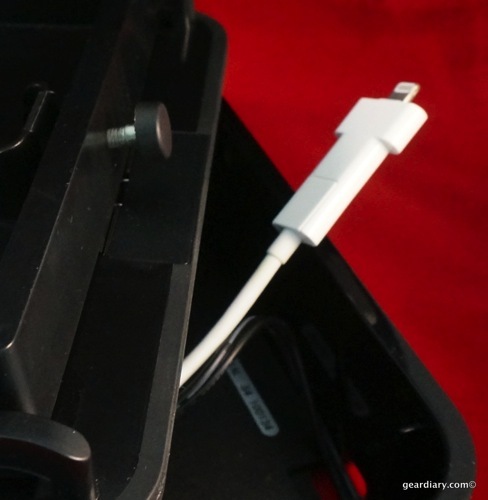 Two of the four USB ports will charge most tablets while the other two are designed to charge phones or other small mobile devices such as Bluetooth headsets. 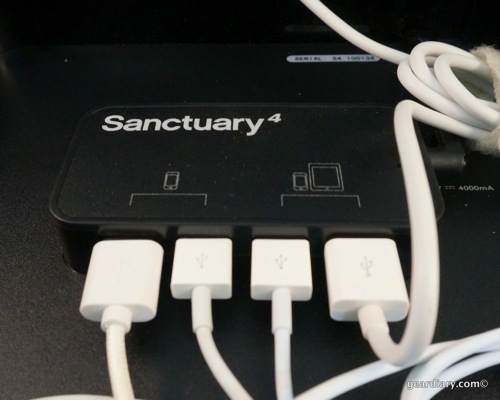 More Powerful Than Ever: With exponentially more power, Sanctuary4 has been completely reengineered with a 4-amp charger to give you enough juice to quickly charge up to four devices at once. While it would have been great for Bluelounge to bundle cables with the Sanctuary4 it actually makes perfect sense that they didn’t. 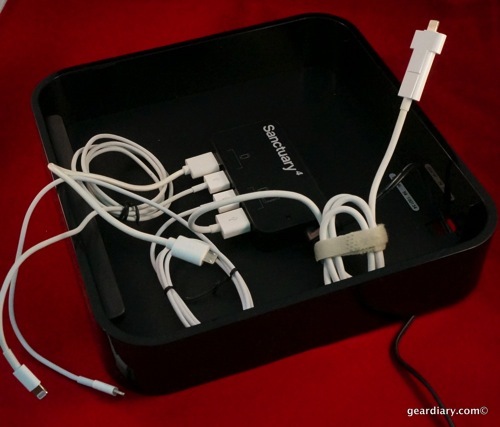 The Sanctuary4 includes four USB ports so you can use the cables that come with your devices. The result is the ability to use the Sanctuary4 with pretty much any device on the current market. 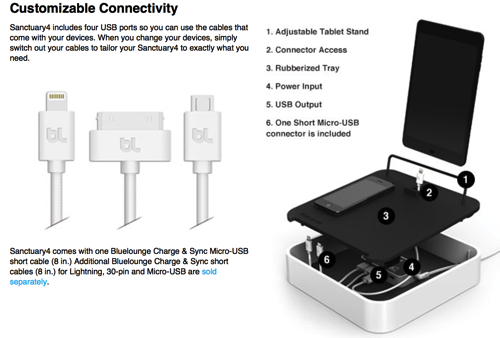 It works with Micro-USB, Apple 30-pin, and Apple Lightning connectors; when your devices change keeping the Sanctuary4 up to date is as easy as swapping out the cables. You can charge four phones at a time or, if need be, two tablets and two phones. That’s thanks to the 4-amps of power offered by the Sanctuary4. 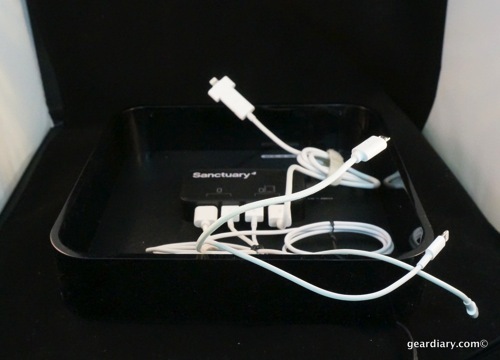 The Sanctuary4 will charge your devices simultaneously with plenty of power to get a full charge with zero drag. So when you’re ready to rock, so are your devices. Each device you own requires a different amount of power to get a full and complete charge. For the best results, the key below shows the recommended device combinations. First you figure out which devices you will want to charge since that will determine which cabled you plug into which USB ports. In my case I used a multi-function cable that switches between microUSB and Lightning connectors and threaded that through the hole in the top designed specifically for tablets. I then threaded two Lightning connectors and one microUSB connector through the gap at the front of the Sanctuary4. 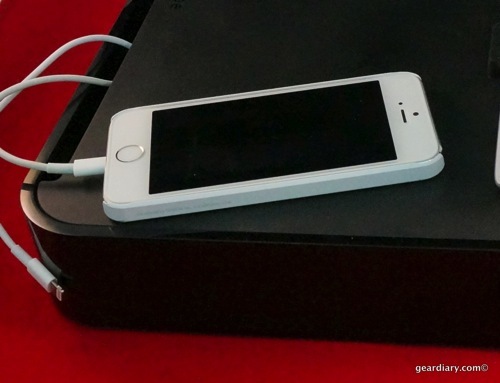 The result is something that looks more than ready to charge up all your devices. But there’s one more step that needs to be taken. 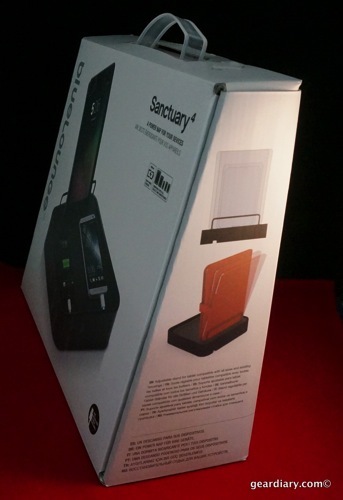 The Sanctuary4 has a tablet stand built into the back. 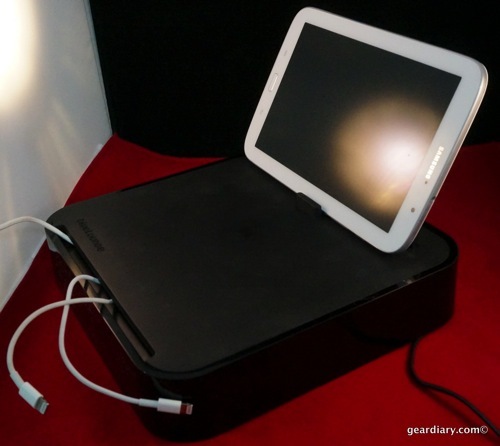 The stand is adjustable so you can use the tablet (or phone I suppose) as a desk or night stand clock. Manipulating the thumb screw makes the angle sharper or shallower. It takes a bit of finesse to get the right angle for your needs and taste but once it is set the extra functionality built into the Sanctuary4 is a great addition. The phone cables feed through the front slot in the Sanctuary4. Thicker cables can be a tight fit but with a bit of pressure the top plate of the unit will fit into place. And while I tend to prefer placing the top plate flush with the Sanctuary4 for a flat surface, Bluelounge clearly recommends placing it in at an angle. I especially love the fact that the Sanctuary4 is not only compatible with pretty much all tablets and phones but it also works with them in or out of cases. I’ve tried a variety of different charging solutions that would help me eliminate my nest of tangled charging cables and am thrilled to have finally found one that is as refined and flexible as the Sanctuary4. Sure, it is a bit pricey but individual charging solutions can add up quickly. The Sanctuary4 means a single purchase and you will be done with all your charging needs. Check it out and order yours here. What Needs Improvement: Takes up a fair amount of desk or nightstand space; $100!